I rarely do this. I want to have a little vent. First up. I made a small mistake, which I have now learnt from. Today at the market we also had an auction to helpline fun for the children’s ward at the hospital (this happens every June, Give me 5 for kids) which is run by one of the local radio stations. A fortnight ago, the DJ’s were in the area at the bakery, talking to locals as well the market organiser. No problem, stall holders asked to donate an item if we could. I gave my necklace – on a bust – to the manager to display, with instructions that I would gift wrap it should it sell. All good. Then came the time for the auction to start. Items were picked up, and then some were bundled with others to make the deal more appealing. Ok, these things happen. And this is where I should have done something, like attach a business card, to my item. I thought they would have listed or named the items. Wrong again. Lesson learnt. The two items: A gift card from another jewellery seller + my necklace were produced, as one sale item. The other lady was not happy when they said it was hers. Correction made, my name spoken out, to some semi cheers, and bidding commenced. Don’t get me wrong, I love competition, but the other seller didn’t look very happy. I’m lucky that I saw the lady who won, hanging onto her necklace, as they didn’t tell her to come and see me. So I went and said I would gift wrap it for her. She was rapt, and very happy with her purchase. And so she should have been. For $35 she got a $20 voucher and my necklace. (For the record, another, simpler necklace set only went for $15 as well). A lot of people had wandered through the market prior to the auction starting but many didn’t stay. I think they should have had items marked and if customers wanted to place a bid and leave their details it could have added more interest and maybe more money overall. Are they allowed to do this, I don’t know. Also, one measly rep from the radio station turned up and barely talked to anyone and was gone within for minutes of the auction finishing. Put it this way. There were five of us in the foyer, and I only saw him speak to one. And there was next to no advising in the two weeks prior. All that aside. I am happy that my item sold, and the recipient was happy with it. On with the show for another fortnight, and we shall see what next fortnight brings us. 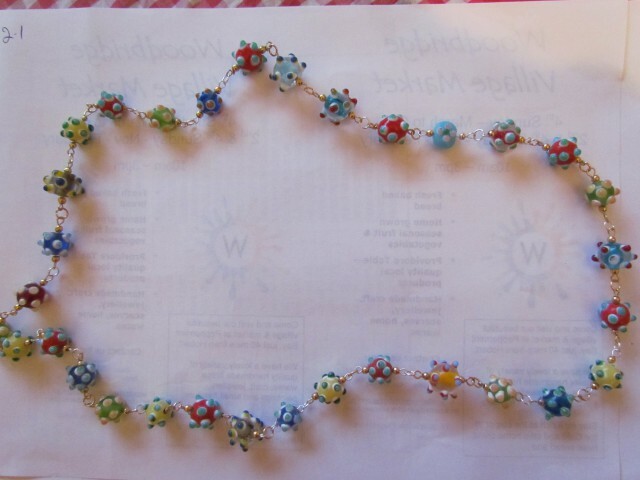 This entry was posted in Craft Shows & Markets, Misc craft posts and tagged auction, bakery, competition, hospital, jewellery, Market, necklace, radio. Bookmark the permalink. Ahh, not sure I would be able to do that, but I will pass on my thoughts at the next market. And yes, I didn’t see the other lady smile much at all, even before the auction when I spoke to her briefly. Best not to associate with her very much then!! I’ll always be polite. But yes, no need to talk her really otherwise.